One of the best things about San Francisco is the hidden gems you can find throughout the city. 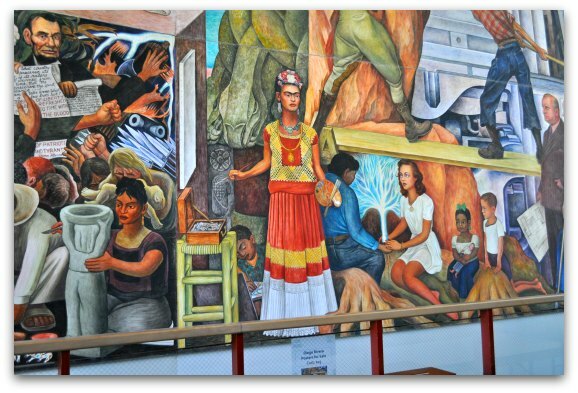 My favorites are the colorful and controversial Diego Rivera murals. 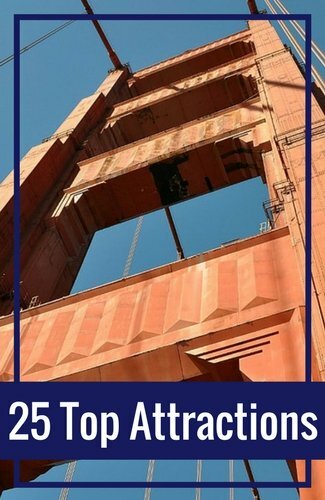 SF is home to three of his masterpieces including the first one he finished in the United States. Even though they are often referred to as murals, they are actually frescos. The difference is that frescos take a special skill set and are difficult to create, but the vibrancy of their colors lasts forever. 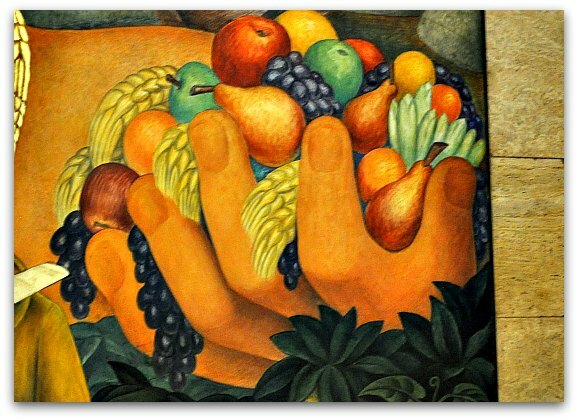 Diego Rivera (1886 - 1957) was a controversial, yet talented artist from Mexico. He was passionate about art, politics and love affairs. His commitment to the Communist party brought quite a bit of attention to him and his highly detailed works of art. As a young artist, Rivera spend several years in Paris hanging out with other talented painters such as Pablo Picasso. He was an artist all of his life, but his time in Paris was instrumental to the direction of his famous frescos in the US and Mexico. 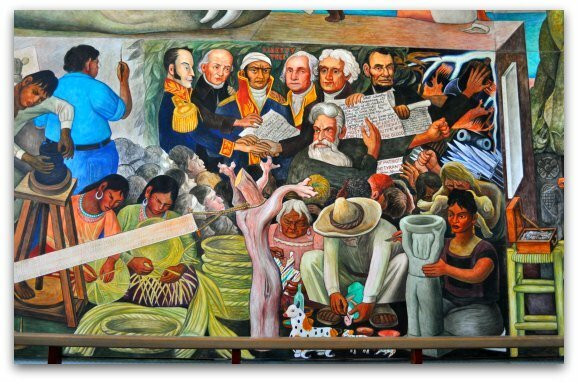 The Allegory of California is the first fresco Rivera finished in the US. He completed this piece in 1931. You will find it adorning the grand stairwell in The City Club in downtown San Francisco. The main female figure is Calafia, the Spirit of California. The piece depicts the state of California at the time of its completion. It also includes well-known local and regional figures of the time. Here is a close up of the right hand of Calafia. It gives you a closer look at the details of this piece. She is holding 'above ground treasures' found throughout the state at the time. It's hard to catch in one picture, but this is an extension of the fresco onto the ceiling above the staircase. Location & When to Visit: This mural is located at 155 Sansome Street in downtown SF. You can see this mural on the first and third Monday of the month at 3pm. This is when CityGuides offers a guided tour of the mural and it's the only time it's open to the public. Please click here to visit the CityGuides site to make a reservation to see this mural. 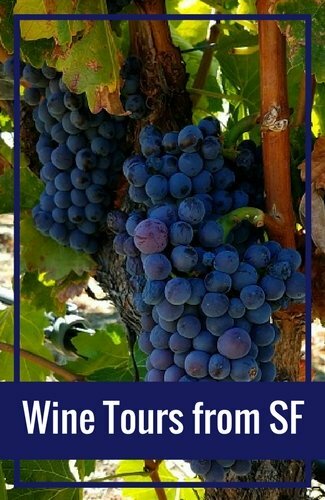 The tour is free and they request that you do not wear shorts, tank tops, or sweats during the tour as you will be entering a high-end, private club. 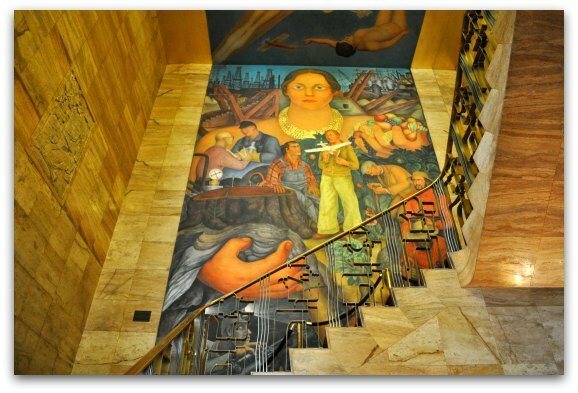 This is the second Diego Rivera mural completed in the US. He completed this fresco in 1931. 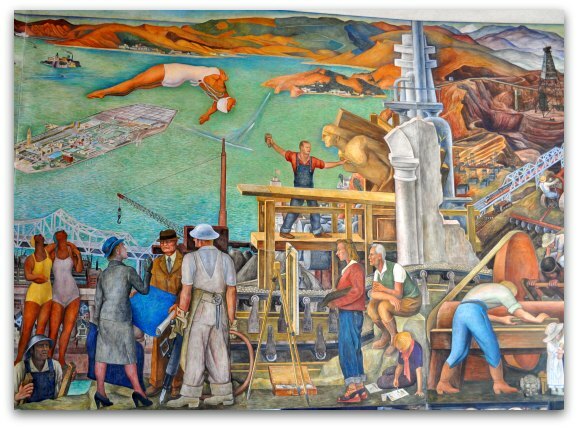 This SF mural sits in the Diego Rivera Gallery inside the San Francisco Art Institute near Fisherman's Wharf, Russian Hill and North Beach. This one is considered a fresco within a fresco. It shows the painters in action as they build the fresco. You can see all of the artists, along with their scaffolding, layered on top of the masterpiece they are completing. 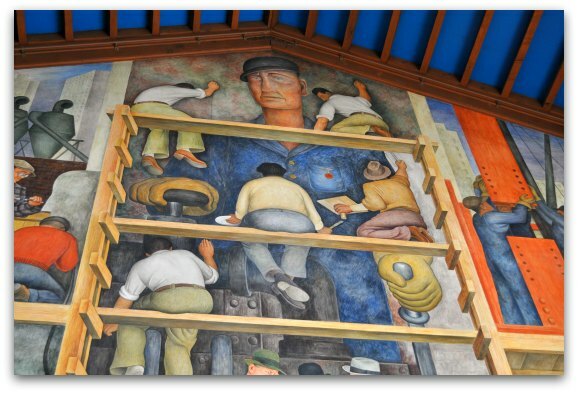 This one also includes the backside of Diego Rivera as he watches the artists work on the fresco below. 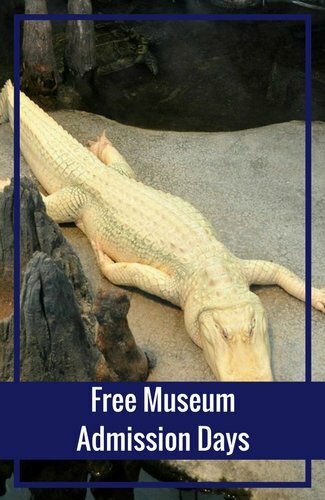 Location & When to Visit: This one is also open to the public every day between 9am and 7pm. 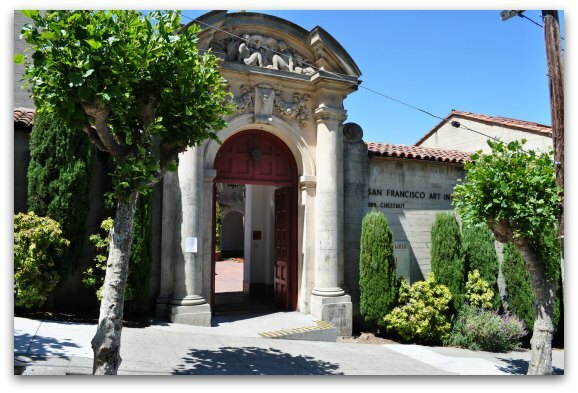 The San Francisco Art Institute is at 800 Chestnut Street (between Leavenworth and Jones). Enter through the doorway shown in the picture below and take an immediate left. Walk to the end and take an immediate right. 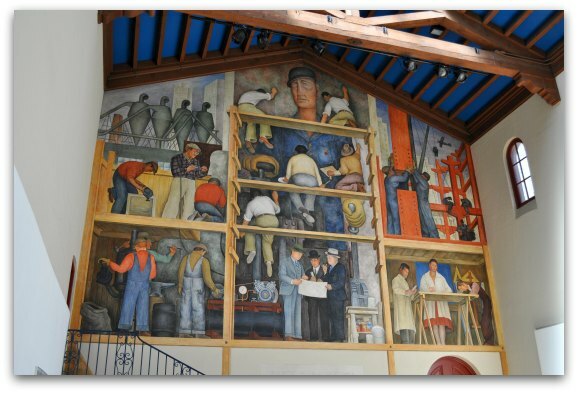 The Diego Rivera Gallery will be the first door on your left. 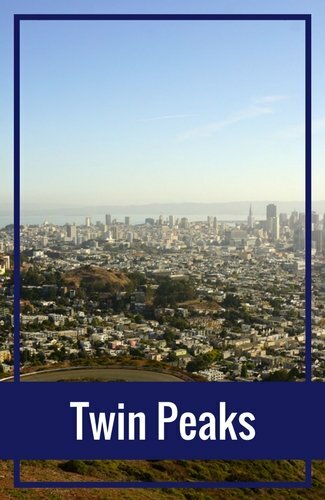 How to Get Here: You can easily walk from either Fisherman's Wharf or North Beach. It's also just a few blocks from the bottom of Lombard Street, the famous crooked street. 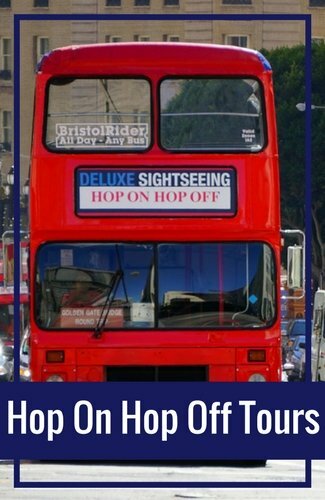 From Union Square, you can take the 30 Stockton bus or the Powell Mason Cable Car. Exit both of them at the Columbus Avenue and Chestnut Street stop. Head across the street and up the hill one and a half blocks to find the entrance. 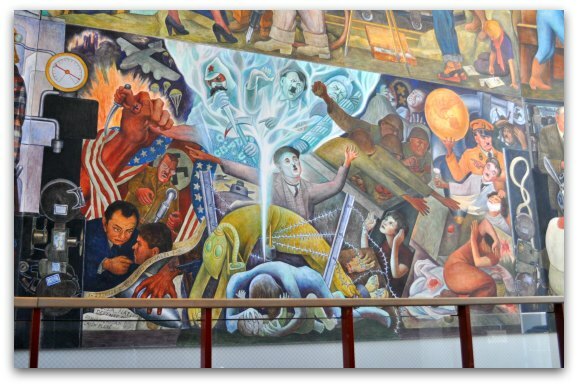 The most magnificent, yet overlooked Diego Rivera mural in San Francisco is the piece entitled the Pan American Unity. This enormous work of art stands 22 feet tall and is 75 feet wide. It is made up of 10 panels and is the largest significant piece of work he did. 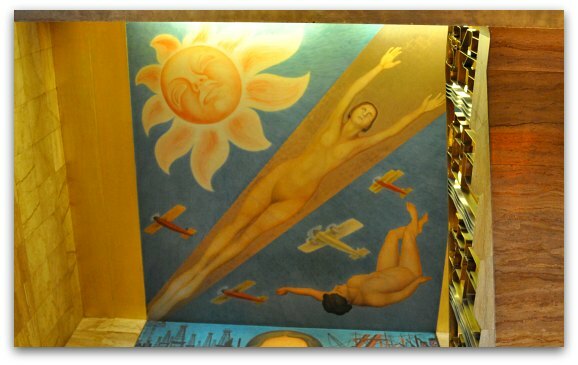 It is also the last official fresco he created in the US. He was commissioned to complete this one during the Golden Gate International Expo on Treasure Island (less than a mile east of San Francisco). He arrived and started work on it in June 1940. Even though the Expo closed in September 1940, he continued his work and completed it in December of that year. At that time, they reopened the doors so everyone could look at the fresco. Shortly thereafter, it was put in crates where it stayed for 19 years. 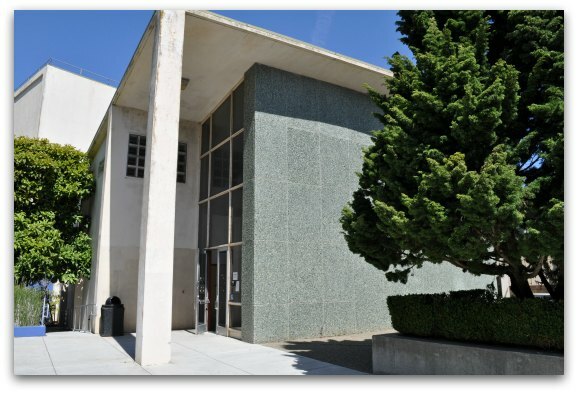 In 1961, the Diego Rivera Theater was built specifically to house it. However, due to the inability to see the entire fresco in this theater, a new building is currently in the works. Each of the 10 panels of The Pan American Unity tells a different story, but they all fit together perfectly. 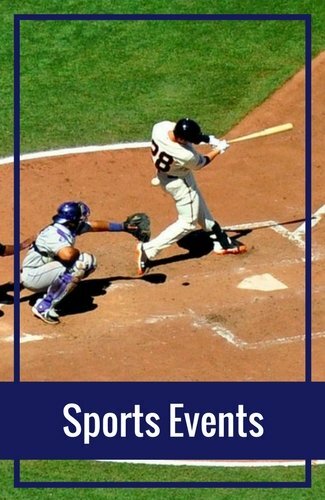 The stories in this piece include everything from Pre-Columbian Mexico to the players in WWII (which was in progress at the time). Here are just a few pictures of the different sections of this mural. This part of his mural features his wife of many years, Frieda Kahlo. This panel is dedicated to some of the events and major players in WWII as of 1940. You will see quite a few things going on in this panel including a view from above of Treasure Island, which is where this mural was created. Location & When to Visit: This mural is also free of charge to visit (although they do accept donations). 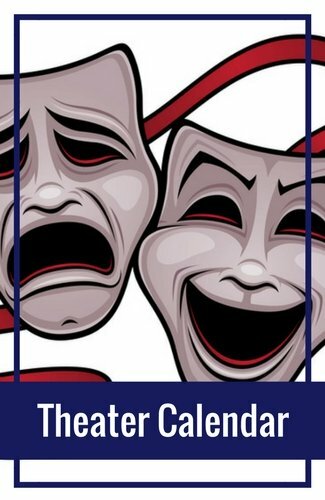 You will find it in the Diego Rivera Theater on the campus of the City College of San Francisco at 50 Phelan Avenue, A301. The hours change frequently due to volunteer availability. Click here to visit their website where you will find their most up-to-date schedule. How to Get Here: It will take you some time and effort to get to this mural, but it is worth it. The best way to get here from downtown is by taking the outbound K train from the underground Powell Street Station near Union Square. Take this all the way to the Ocean Avenue and Lee Street stop. It takes about 45 minutes. Here is a map showing the location of the mural in relation to the K line stop. Once you get off the train, follow the students onto campus. Walk down Phelan Avenue, past the large building on the top of the hill and take a right onto Cloud Circle. Follow this to the walkway between the Visual Arts and the Creative Arts Buildings. 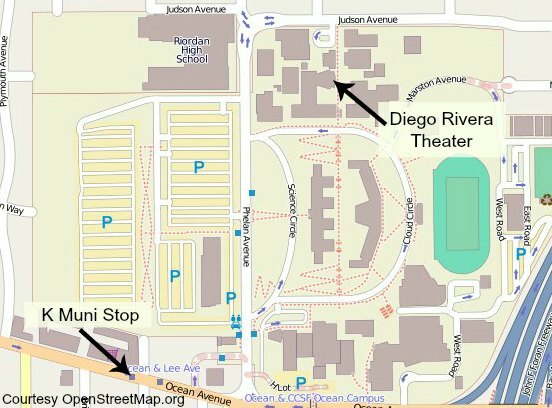 The Diego Rivera Theater will be the second building on your left. This is what it looks like from the outside. During my last visit, there weren't any signs, which made it hard to find. 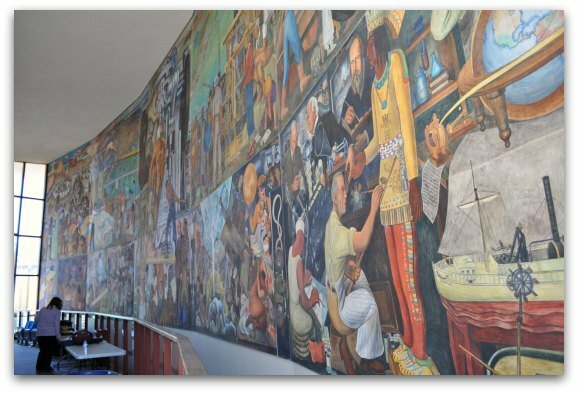 Note: Most students don't realize there is a Diego Rivera mural on campus. 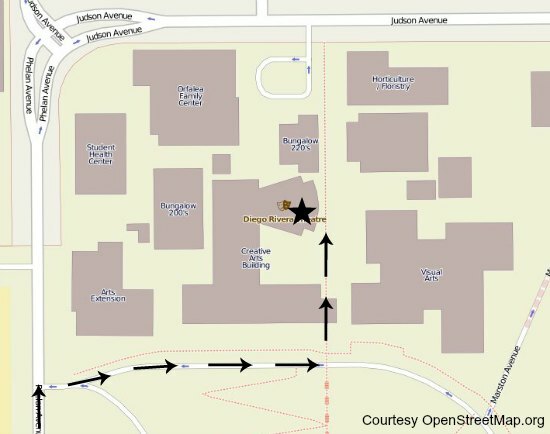 If you have problems finding the theater, check one of the on campus maps instead of asking around (as you will get discouraged when you ask the students). Also, take along the instructions above to help find it when you arrive.